Mix together the sake, soy sauce, ginger and cilantro and marinate tuna steaks in this mixture for 1 to 2 hours. 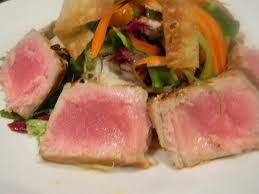 After tuna steaks marinate, place them in a hot pan with 2 Tablespoons of butter, and sear to desired doneness. In a 12-inch skillet over medium heat, melt 2 Tablespoons of butter. Add onion and garlic and sauté for 4 to 5 minutes. Add jalapeño and mushrooms and cook for another 6 to 8 minutes. Take one cup of cooked brown rice and place in food processor and pulse until coarsely ground. Put the ground rice and whole rice in a bowl, season with salt and pepper, and add sautéed vegetables. Mix well. Form rice into cakes. Heat 12-inch skillet over medium-high heat and add remaining 2 Tablespoons of butter. Sear rice cakes for about 2 minutes per side. In a medium saucepan, warm ½ cup fish or vegetable stock. Add 2 Tablespoons of cold unsalted butter and melt. Remove from heat and add wakame. To serve, place wakame (with sauce) on the plate, top with rice cake and then tuna steak. Que le Seigneur vous accorde la grÃ¢ce de proclamer seulement sa pensÃ©e.A quoi aurait servi la mort et la rÃ©surrection de notre sauveur JESUS-CHRIST?De la bouche d’un chrÃ©tien ne saurait sortir des bÃ©nÃ©dictions et des macoudiltiÃns!! !Ce©x qui sont de Dieu connaissent certainement ses voie et voix.